A car that crashed into a fence on a Market Harborough housing estate had been pursued by the police, the Mail has been told. The car crashed into a fence on Simborough Way, off Ashley Way, east of the town centre. The driver ran off after the crash. Leicestershire police told the Mail that the crash happened just before 8am on Sunday, August 21. A police helicopter was soon in the area, helping in the search for the car’s driver, but he was not found. A Leicestershire police spokesperson said: “The driver made off from the scene. Leicestershire police added that the Market Harborough crash was related to a “fail to stop” incident earlier the same day in Northamptonshire. This was confirmed later by a Northamptonshire police spokesperson. They said: “It looks like this Market Harborough incident is linked to an earlier incident in the Kettering area. She said the car had been spotted by police at around 7.45am, stopped on a roundabout. 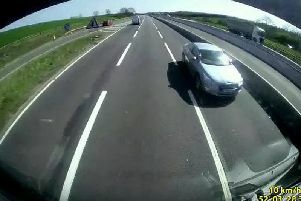 When the vehicle was approached by Northamptonshire police, the driver made off. “Northamptonshire police officers had been in pursuit of the vehicle, which failed to stop when requested” said the Northamptonshire police representative. The car travelled along the A14, and then took the A6 towards Market Harborough. The Mail has been told that the car was not being pursued at the time of the accident in Simborough Way. The police ceased their chase between Desborough and Market Harborough. The car’s driver is believed to be male. There were no other people in the vehicle.